HAL Notification is out. HAL is recruiting for 77 Assistant And Operator Govt Job Posts. You can check HAL - Hindustan Aeronautics Limited last date, download HAL notification, visit HAL official website and check other HAL Vacancy details.Complete Vacancy and recruitment Details about 77 Assistant And Operator Govt Job vacancies in HAL are provided below by JobSarkari.Com only for you. Last Date for Apply Online. 13/02/2019. Assistant (Admin/ Accounts) 05 03 02 00 10. Assistant (Q.C./ Inspection)/ Assistant (Commercial)/ 16 09 07 00 32. Assistant (Civil Works) 01 00 00 00 01. Operator (Fitter) 12 07 05 00 24. Operator (Electrician) 02 02 01 00 05. Operator (Electronics Mechanic) 01 01 00 00 02. Operator (Instrument Mechanic) 01 01 01 00 03. Total No. of Post 38. 23. 16. 00. 77. Assistant (Admin/ Accounts) Candidate Must Have Passed Regular Master Degree in Commerce (M.Com) with Relevant Certificates of Proficiency in PC Operations (Minimum of 03 Months Duration). (Commercial) Candidate Must Have Passed 03 Years Regular Diploma in Mechanical Engineering From Any Board of Technical Education. Assistant (Civil Works) Candidate Must Have Passed 03 Years Regular Diploma in Civil Engineering From any Board of Technical Education. Mechanic / Instrument Mechanic) Candidate Must Have Passed 02 Years Regular ITI (NTC) with National Apprenticeship Certificate (NAC) after 10th Standard in the Trades of Fitter/ Electrician/ Electronics Mechanic/ Instrument Mechanic. For SC / ST 33 Years. 1. Written Examination and Document Verification. 6.Online Application Can be Submitted on or Before 13th February 2019. Q. 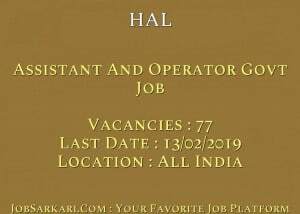 What is the Last Date For HAL Assistant And Operator Govt Job Vacancy ? A. 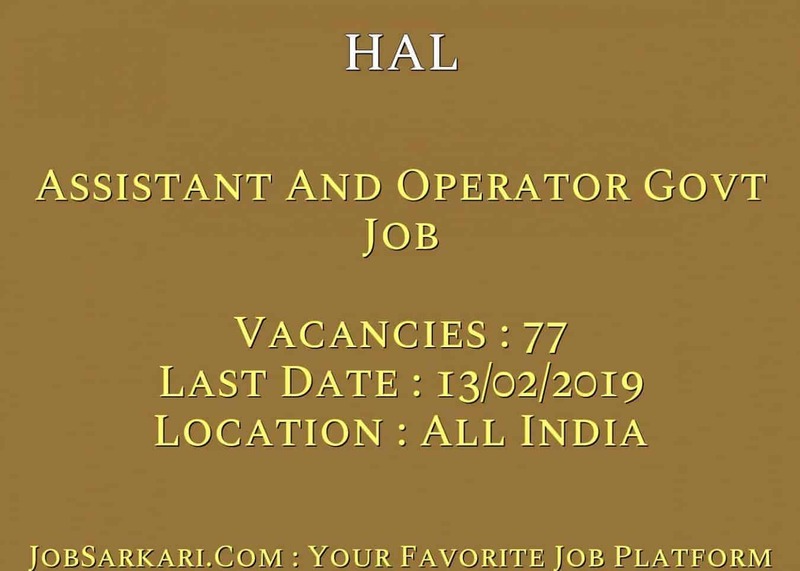 Last Date for HAL Assistant And Operator Govt Job Posts is 13/02/2019. Q. What is the Form Type of HAL Assistant And Operator Govt Job Recruitment ? A. The Form Type for HAL Assistant And Operator Govt Job Posts is Online. Q. How many vacancies are available in Hindustan Aeronautics Limited Assistant And Operator Govt Job Posts ? A. There are about 80 Vacancies in Hindustan Aeronautics Limited Assistant And Operator Govt Job Posts. Q. What is the Full Form of HAL ? A. Full Form of HAL is Hindustan Aeronautics Limited .